Assessing vendors is a tricky process. Large and regulated organizations are forced to demonstrate due diligence in vendor assessment, but often do not know how to do this. This results in a great deal of busywork being required by both the vendors and the organizations. Smaller organizations don't know what to look for and, as a result, often wind up selecting based on price instead of value. This results in service failures and vendors that just milk their customers for as long as they can. Assessing Vendors shows you how to walk the line between under- and over-assessing, so decisions can be made on sufficient data without wasting time, digging too deeply, or making decisions too quickly. 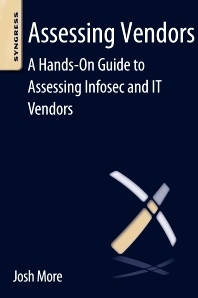 This hands-on guide will show you how to use an iterative approach to vendor analysis, so you can rapidly filter out the vendors that are clear failures and then select likely winners. It will then show you how to do progressively deeper dives into the likely winners so you can select a preferred vendor. Finally, you will learn how to negotiate with your preferred vendor to get reasonable prices and services.